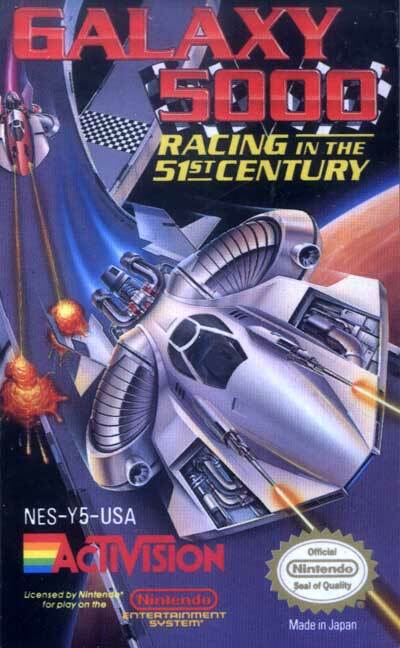 Galaxy 5000 is an isometric-perspective space racing game where 4 spaceships compete head to head in outer space races. 1 or 2 human players can compete in the races; the rest of the ships are controlled by the computer. The ships complete several laps around each course and have limited firing capacity to throw their opponents off balance. The ships can also jump. In fact, the ships can jump right off the edge of the course and drop down (in space). If the player does not complete a course in good time, the entire race track will disintegrate and leave the ship to fall down (and apparently splash into some water below). A notable item about this game is its use of squeaky, comical, digitized voices for exclamations when colliding with another player ("Hey! ", "Excuse me! ", "Watch it!"). There are also 2 completely different control schemes that a player can adopt for cruising around the course. The first scheme rotates and drives the ship in the direction that the control pad is being pressed. The second scheme uses left and right to rotate the ship and up to thrust in the direction the nose is pointing.